SHANGHAI, May 3 (Xinhua) -- Chinese scientists have built world's first quantum computing machine that goes beyond the early classical -- or conventional -- computers, paving the way to the ultimate realization of quantum computing beating classical computers. 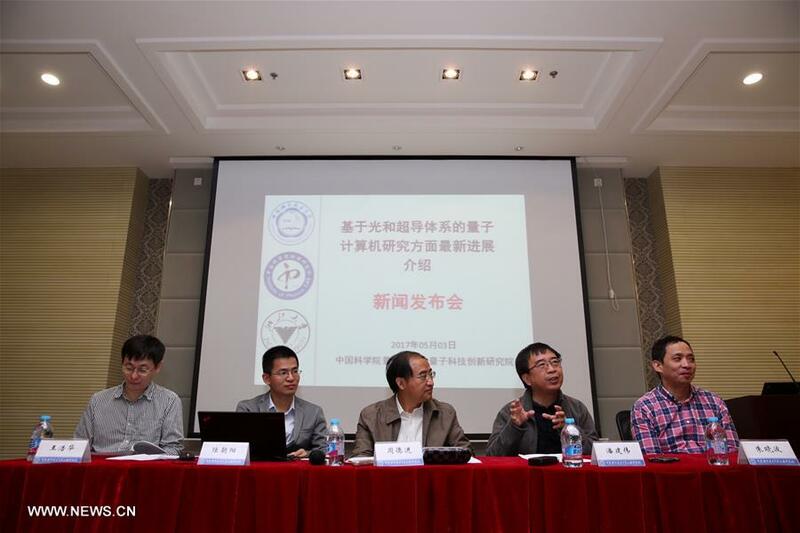 Scientists announced their achievement at a press conference in the Shanghai Institute for Advanced Studies of University of Science and Technology of China on Wednesday. Many scientists believe quantum computing could in some ways dwarf the processing power of today's supercomputers. The manipulation of multi-particle entanglement is the core of quantum computing technology and has been the focus of international competition in quantum computing research. Recently, Chinese leading quantum physicist Pan Jianwei, an academician of the Chinese Academy of Sciences and his colleagues -- Lu Chaoyang and Zhu Xiaobo, of the University of Science and Technology of China, and Wang Haohua, of Zhejiang University -- set two international records in quantum control of the maximal numbers of entangled photonic quantum bits and entangled superconducting quantum bits. Pan said quantum computers could, in principle, solve certain problems faster than classical computers. Despite substantial progress in the past two decades, building quantum machines that can actually outperform classical computers in some specific tasks -- an important milestone termed "quantum supremacy" -- remains challenging. In the quest for quantum supremacy, Boson sampling, an intermediate (that is, non-universal) quantum computer model has received considerable attention, as it requires fewer physical resources than building universal optical quantum computers, Pan said. Last year, Pan and Lu Chaoyang developed the world's best single photon source based on semiconductor quantum dots. Now, they are using the high-performance single photon source and electronically programmable photonic circuit to build a multi-photon quantum computing prototype to run the Boson sampling task. The test results show the sampling rate of this prototype is at least 24,000 times faster than international counterparts, according to Pan's team. At the same time, the prototype quantum computing machine is 10 to 100 times faster than the first electronic computer, ENIAC, and the first transistor computer, TRADIC, in running the classical algorithm, Pan said. It is the first quantum computing machine based on single photons that goes beyond the early classical computer, and ultimately paves the way to a quantum computer that can beat classical computers. This achievement was published online in the latest issue of Nature Photonics this week.